11, 3 p. : ill. ; 27 cm. developed from 2-pound packages are shown in table 1 and figure 1. /'In cooperation with the University of Wisconsin. 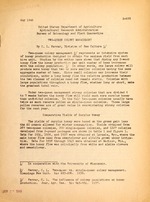 'JFarrar, C. Le Two-quier vs. single -queen colony management. Gleanings Bee Cult. 6,4:-593-596. 1936.
production. Jour. Agr. Res. 54: 945-954. '37. The two-queen colonies (omitting 1936 and 1942) produced on an average 111 pounds more honey than single-queen colonies. When the seasonal average yields for single-queen colonies were multiplied by the respective numbers of two-queen colonies for each year, the weighted average showed a difference of 106 pounds in favor of the two-queen colonies. During the period 1938-1945 the two-queen colonies averaged 156 pounds more honey than package colonies. When the number of package colonies was weighted to the number of twoqueen colonies for each year, the difference in production between the two groups amounted to 162 pounds. The production figures given in table 1 express the difference in yields on a relative basis. colonies over a period of 8 years. The performance of any colony is affected by the queen's capacity to lay eggs and her ability to produce throughout the season, the initial, population at the bea-irning of' the active season, the available pollen supply, and the time and length of the honey flow. Seasonal conditions and some variations in the management over the 11-year period influenced the performance of colonies to a considerable degree. Queen failure prevented some two-queen colonies from developing maximum populations for the honey flaw. It seems probable that even larger yields could have be:-en obtained from. the two-queen colonies had the most successful practices been applied equally throughout the period. No attempt was made to carry colonies through several productive seasons under the same management. IfI this had been done, the twoqueen colonies would have had an advantage because of their large pollen reserves. Approximately equivalent coloniwes 7-ere selected for both groups at the beginning of each season. Since the colonies were usually distributed among several apiaries, the yields are indicative only of the production within ldc~lity. Minor differences in the honey flows were recognized within the area. However, the general averages tend to equalize the variations due to location, stock, and other factors. In these tests on comparative yield, 10-frame Langstroth hive equipment was used exclusively. Under the dry conditions existing in the Intermountain States, 7 hive bodies gave adequate storage space, provided the honey was removed and extracted weekly during the main honey flow. Under the more humid conditions of the North Central States, 8, 9, and sometimes 10 bodies were required to provide storage space for the thinner nectar. Hives 7 stories high can be worked satisfactorily, but few beekeepers will care to operate 8- to l0-stoxr hives even if justified by the increase in yield. In prpliminary tests a shallow type of hive body for both brood chambers and supers has been shown to have advantages when intensive management practices are applied to either single- or two-queen colonies. Shallow brood chambers came into disrepute because they were used to restrict brood rearing in order to force most of the honey into the supers. The wide use of 2-story brood chambers has proved that hive capacity is far more important than the size or shape of the brood frames. Even the beekeepers who prefer brood frames deeper than standard now generally use either one and a half or two deep brood chambers. The size and shape of the hive unit has little effect on production when sufficient space is provided for brood rearing, food reserves, and the storage of surplus honey. Success is determined by the skill of the operator in providing hive space for the colony at the right time and in the'right place. Because of an expected improvement in stock,, the use of two queens, and the greater control- over colony development through the effective use of pollen supplements or substitutes, changes in hive equipment appear desirable. The size and design of the future hive unit will eventually be determined by its adaptability and the ease with which it can be used to produce maimum crops. desirable for the production of crops approximating /400 to 500 or more, pounds. More efficient management is possible when all hive units are uniform in size and therefore interchangeable. Super combs or a depth that will be filled and sealed more rapidly than present standard combs are needed to hasten the removal of surplus so that ample storage space can be maintained. A shallow hive body helps to limit the height of the hive and reduce the gross weight of fall. supers. Beekeepers should welcome such a change even though they must handle more units. to allow greater ease of manipulation. The present top bar used in Modified Dadant shallow frames is approximately 1/4 inch thicker than desirable, but the standard thickness of lumber now available makes it the most economical top bar to use. Shallow bodies make it possible to substitute body manipulations for many colony adjustments which ordinarily have to be made by manipulating the frames of standard or deeper equipment. Limited tests have shown the advantage of the shallow equipment both for the productive season and in the overwintering of large colonies. The space between brood chambers favors the intercommunication of bees within the winter cluster. Eleven-frame Modified Dadant shallow supers or even standard 10-frame shallow supers can be substituted, provided a sufficient number are used to give adequate hive capacity. The height of the hive necessary to accomplish this is the limiting factor. The 3/8-inch top bars of the standard shallow frames are too light for the maintenance of good brood combs. One should probably use standard shallow supers with Langstroth brood chambers even though it means mixed equipment. It is essential that strong colonies be used for establishing twoqueen units. The division should be made as early as the condition of the colonies and the available pollen supply will permit uninterrupted brood rearing. To obtain maximum production the overwintered colonies should contain 7 to 8 pounds of bees and 6 to 10 frames (standard) of brood 5 to 7 weeks before the honey flow. It is better to make the divisions 1 to 2 weeks later under favorable conditions than to make small divisions or to make them when pollen is not available for brood rearing. management for two-queen colonies are diagrammed for standard equipment in figure 2 and for the square type of shallow hive in figure 3.
approximately 60 percent of the original population. Some of the bees 'will drift back to the lower entrance., but this division tends to give a fairly equal balance to the two colony units. The more mature brood is used in the upper unit, because fewer bees will be required to protect this brood, and the division will be strengthened by emerging bees. A 1-inch Auger hole just below the front handhold provides an entrance for the upper colony. The young queen may be introduced by any of the customary methods. The rearing of a queen from queen celis in the division results in loss of valuable brood-rearing time. The new queen may be introduced by the mailing-cage method, but the-losses that usually result tend to offset the advantage of its simplicity. The direct introduction of laying queens from nuclei has proved the most successful method under all conditions. South should. be sprayed into small. nuclei to provide the laying queens. 4 Three queens can be purchased with each 2-pound package, or the queens alone may be obtained and introduced to package bees shaken from the stronger overwintered 'colonies. 'When uniting these bees to the nucleus in the absence of a honey flow, the operator should spray both units with sugar sirup. usually 10 to 14 days after introduction, the screened inner cover can be removed. In this uniting of the two colonies, the bees in both brood nests should be sprayed with sugar sirup. The upper queen may require a second set of brood combs at this time., thus making the colony five stories high. Both upper brood chambers should have augerhole entrances. The upper and lower brood nests must both have reserve honey and pollen even after uniting. Brood rearing may suffer or the bees may starve in one, even though the other has plenty of food. s orage, the organization diagrammed in figure 2,,C, should be maintained. Ten standard combs provide plenty of space for a good queen in the lower brood nest, as very little honey is stored here. Supers in positions 2 and 3 should never be allowed to become more than half filled with honey. Too much-honey here will cause the lower brood nest to become honey bound and the hive will operate as 6vo separate colonies. When these supers become partially filled with honey, they should be raised above the upper brood nest and replaced by empty supers. The position of the two chambers used for the upper brood nest should be interchanged at each manipulation, the heaviest chamber and most of the immature brood being placed in the fourth position with the sealed and emerging brood in the fifth. and returned f or refilling. 6 to 8 days to maintain the optimum organization as diagrammed in figure 2,C. Supers with empty combs from which the honey has been extracted are placed between the two brood nests. Those- containing some honey in positions 2 and 3 are placed above the upper brood nest for finishing. During heavy honey flows, especially when the nectar is thin, one or two additional supers may be needed above the upper brood nest to keep the supers in positions 2 and 3 comparativel1y free of honey. Colonies should be united back to single-queen status approximatelyv 4 weeks prior tothe expected end of the flow (fig. 2,fl). It is 'seldom necessary to locate the queens. The upper queen usually survives, but if the lower one does, it is likely that she is the better individual. With three brood chambers at the disposal of the surviving queen, manipulation is seldom necessary if r the remainder -of the, season. Super space should be provided generously. These double colonies may make daily gains of 20 to 30 pounds under flows that permit singlequeen colonies to gain 8 to 12 pounds. Plenty of space is needed for the incoming nectar in addition to that required for storing honey. Combs should be extracted and the super returned for refilling as soon as-they are finished. The use of shallow equipment hastens the finishing of supers so that space can be provided when and where it is most needed. up pollen reserves rapidly if pollen is available in the field. They have the population of two colonies and the brood of only one queen. For the same reason honey storage is at the most efficient level for the number of bees in the colony. colcmy should be left in three stories for overwintering (fig. 2, E). The three-story colony should'contain 80 or more pounds of honey and as much pollen as possible. In standard equipment such a colony should have a gross weight of at least 175 pounds. Colonies may not use all of the reserve honey, but this practice provides the best insurance that the colonies will be ready for the next honey flow. Honey that is not consumed will add to the next year's honey crop by- reducing the amount required to-build up the reserve. queen colonies can be manipulated more easily if two men work together. After the bees at the entrances have been smoked and the metal cover has been removed, the hive, supported by a man on each side, can be tipped over backwards-and worked in a horizontal position. The propolis 'will prevent the hive bodies from slipping,, even'while the" heavy 'beven- to nine-story hives are lowered to the ground. should not be more than one-third to one-half full. When necessary to provide additional room, an empty super should be added on top. Working the hives in a horizontal position does not eliminate the necessity of lifting the hive bodies back into position. However, it does reduce the labor of manipulation. The'upper queen lis less likely to run into the supers, and the bees' are more gentle. The returning field bees are confused and offer little resistance. Those in the top hive bodies are not driven down into the lower part of the hive, where they would later be disturbed under a diLsorganized and congested condition. Ill-tempered bees are usually encountered in the lower part of the hive when working from the top down. A queen excluder over the lower brood nest is a necessity. Another queen excluder below the upper brood nest mill prevent the upper queen from running down into the intervening supers when the colony is manipulated. Its use saves time in hive manipulation because the operator knows the location of the upper queen. A third excluder over the upper brood nest may be used to advantage under some conditions, but it tends to force more honey into the brood, nest. to expand her brood nest normally upward. drawn combs are available for both brood chambers and supers. During the main honey flow, foundation can be drawn between the two brood nests. Only the lower queen should be restricted with an excluder when the supers contain foundation. The use of foundation sometimes forces so much honey into the upper brood nest that empty combs must be substituted for those filled with honey in order to give the queen, room. The problem of supersedure is no greater in two-queen than in single-queen colonies except that, when one queen is poor and queen cells are started, cells usually will be built in the other brood nest. nests must be completely separated, as when the original division is made. After all queen cells have been removed, a nucleus with a good laying queen may be united by the spray method. If there is a honey flaw' the screened inner cover can be exchanged for a queen exclude at the next manipulation without spraying the bes. both brood nests, and space for brood expansion and honey storage is provided by timely manipulations. Sinced the two-queen colony mar have 25 to 30 pounds of bees, a great loss will result if the colony is allowed to swarm. The wings of both queens should be clipped. If the colony attempts to swarm, both queens may be found in the lower brood nest. One of the queens may be returned to the upper brood nest when the conditions that caused swarming have been corrected. However, when the queens are shrunken, the drastic treatment of making a "shook-swarmR with one of the queens on a new set of combs probably is best. The other queen, with all the brood and adhering bees, can be set to one side to allow many of the bees to drift back to the original hive location. When both queens are laying normally, the hives can be recombined in a manner suitable to the honey flow (fig. 2,1). above the lower brood nest. A moving screen is placed above this., and the upper brood nest set on the screen. The double colony is wintered in four bodies., with the lower half given a reduced bottomboard entrance and the upper half only the auger-hole entrance in the top chamber. The auger holl-9 in the second and third-hive bodies are closed. A commercial who has used this plan successfully during several seasons bel_"sves that less honey is required than when the colonies are maintained separately. His bees have had abundant pollen reserves., and both the upper and lower colonies have wintered strong. Weak colonies in the spring may be set above good colonies in the manner used to organize two-queen.colonies by division. An excluder is used beneath the weak colony in place of the inner cover. The bees of both colonies should be sprayed with sugar sirup when they are set together. If the weak colony has a good queen.. the bees that move up from the lower colony will enable tier to expand brood rearing. If it has a poor queen., nothing is lost as would be the case where brood or bees from a good colony are taken to strengthen a weak one. Two-queen management is based upon the principle that the production per unit number of bees increases as the population is increased. Two-queen colonies have two chances of remaining queen-right, which under commercial management practically eliminates all nonproducing colonies due to queen failure. Colonies are overwintered with young queens and the beekeepers' attention is focused on queen quality at all. times. The larger pollen reserves accumulated after the colonies have been reduced to a single-queen status make it possible to overwinter strong colonies for the next season. Less equipment is used in producing a given crop of honey than is customary under single-queen management. However., there are some limitations to the use of standard hive equipment for two-queen colonies. operators for their efficient management. Approximately 50 percent more labor is required per colony butless labor per pound of honey produced. Close timing of manipulations is essential to meet the twoqueen colony requirements, but this is equally important for the efficient management of any colonies. ,O 1 (D (D r.
10 cv CV H r--i N 0 rz 4--1 r.